The compact device series for DC charging stations has now been extended by the new isoCHA425HV. It is specially designed for DC charging stations according to the Japanese CHAdeMO (Charge de Move) charging standard for voltages between DC 50 V and max. 1,000 V. All new charging stations can thus be monitored even more reliably in future. The CHAdeMO electrical interface for electric cars was developed in Japan and is now in cross-brand usage and can be found at every third charging station worldwide. In contrast to conventional monitoring devices, the isoCHA425HV reports single-pole insulation faults with a response time of ≤ 1 second, and two-pole insulation faults within 10 seconds. This is a big advantage when monitoring DC charging stations according to the CHAdeMO standard. Up to now, only single-pole faults that occur at DC+ or DC- have been monitored. Two-pole/symmetrical faults have not been monitored. Symmetrical faults often occur mainly due to moisture associated with dust, dirt or road salt. These factors lead to ageing of the charging lines, which generally results in a consistent drop in the insulation level. So far, no tripping has occurred in the case of symmetrical faults, although the insulation level had already dropped. With the isoCHA425HV and its additional symmetrical fault monitoring, Bender extends monitoring and significantly increases safety in DC charging stations according to the Japanese CHAdeMO charging standard. Furthermore, measurement is secure and reliable even under difficult conditions because the separate supply voltage makes it possible to monitor the charging station even if no vehicle is being charged. 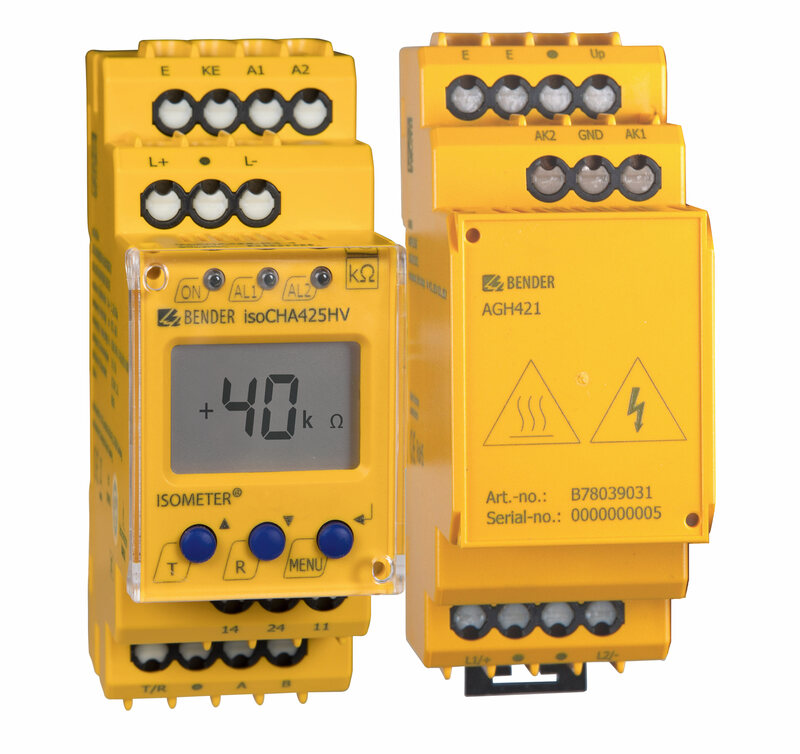 The devices can be operated using the voltages typically present in the control cabinets by using a wide-range power supply with AC 100...240 V or DC 24...240 V.
Two separately adjustable response values enable early notification via an alarm relay long before the system reaches a critical status. This is a further advantage over existing monitoring devices, which are equipped with only one switching output that switches off in the event of a fault. Pre-warning when the value falls below a higher threshold is not provided for and therefore not possible.